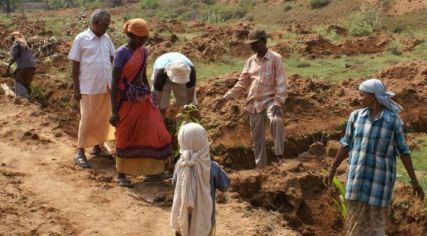 In Feb 2013, our friends from Tiruppur, Anand, Selvi and their farm-boy son Akshay came to help us with making 9 cents (approx 4000 sq ft ) of land cloes to home ready for growing. 7 years ago, 4 ft of top soil from this area was removed and sold so it was not going to be an easy job. Akshay’s love and finesse for work inspired Aum to work alongside and the six of us could carve out two dozen decent beds out of this parched land. Anand and Selvi also went an extra step and spread some manure on these beds. The next day, Ragu and I sowed a hardy variety of sorghum gifted to us by our friend Karthik who traveled a long way just to get these seeds for us. with 10 cm spacing in rows and columns and started irrigating the land. At that time, the weather was hot and dry. Less than 25% of the seeds germinated. And most of those wilted away inspite of continuous watering within a week. The same seeds had shown 100% healthy germination in a bed close to home. While we felt a little sad that we had nothing to show for the hard work put in by so many friends, we just had to conclude that this (lack of) soil was not ready for cultivation yet. And we decided to rest it through the summer and may be sow green manure again whenever the rains set in. After adding couple of layers of soil and manure each, mixing and leveling, we were ready to sow. The seeds had come from far and near. Many were from our friends Neerad and Sheetal in Pune. Yogi brought more seeds from the Chembur market in Bombay. To add to the variety, Karan brought his seed stash. And we had some locally harvested ones. Yogi had made a plan to try out different combination of seeds on different beds and we tried to follow Da Plan. Peter had chipped away lots of Gliricidia leaves as mulch to help these tiny seeds beat the giant bermuda grasses at their own game. After a week, the mulch had nicely disintegrated and integrated into the soil. And 7 of the 10 beds were teeming with life and some beds remained empty in parts or full. We firmly believe that these seeds were at fault because all the seeds were sown by Karan, The Germinator. Empty beds were quickly populated with green gram sprouts that were originally intended for our breakfast. And the partly empty beds were populated with extra tomato saplings Karan had planned as backup. We’ve been adding some elements to increase lcoal diversity. Every bed has three Agathi plants (Sesbania Grandiflora) for nitrogen fixing, some Omam (Ajwain, Carom) for attracting butterflies and a couple of Karpooravalli (Indian Borage) plants for repelling insects. Other beds have also been made around the house to grow veggies like flat beans (bush variety), radish and ladies finger. The trellis also looks good with many flowers of snake gourd, bitter gourd, bottle gourd and ridge gourd. The snake gourd has already started yielding. We spend about 30 minutes evey day trying to take care of these veggie beds. The work so far has involved supporting the gourds with sticks or cutting of grasses and weeds and using them to mulch the beds. Coming week, we plan to spray a dose of Pancha Gavya.